The movie version of The Remains of the Day is an elegant but sad love story between the butler and the housekeeper of an English estate between WWI and WWII. The butler’s uncompromising standards and obsession with his work doom their romantic relationship. The book version is an entirely different story. The attraction is still there, but it is secondary to the main plot. That story is about how the butler’s uncompromising standards and obsession with his work make him unable to hold his own opinions about literally anything else. Between the wars, some British, including the butler’s employer, Lord Darlingon, were trying to appease the Nazis. All the butler is able to do is go about his work. In this case, there is a conference between the Germans and the Brits in the house; it ends badly. See, now this is a book about an awful yet sympathetic person that was a delight to read. 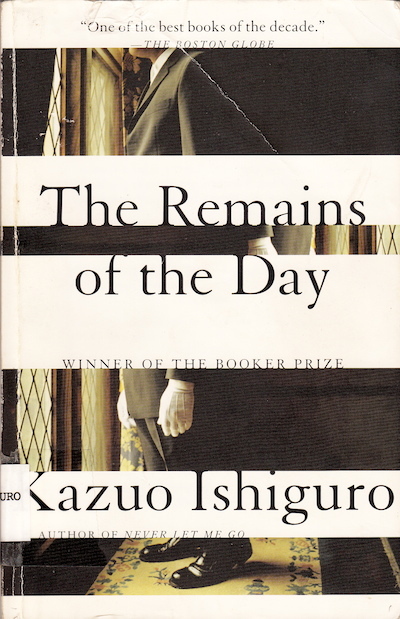 Kazuo Ishiguro writes divinely, you sympathize with the butler who wants to do his job as best he can, and you see the German-British relationship for the tragedy it was. You might even mourn the end of the British Empire. While the book was entirely different than what I expected, I still enjoyed it. Next Next post: Real world? What real world?